Earth just can’t catch a break, can it? First, you have Lex Luthor pitting Batman and Superman against each other. Then, Steppenwolf shows up to cause a ruckus in his pursuit of Mother Boxes. What’s next? Is Darkseid going to show and start wrecking up the place? All of this recent activity as really lead us to one simple conclusion. We need more heroes. With all of these world-ending threats happening, we just don’t think that Batman, Superman, and Wonder Woman are enough. Sure, Flash is pitching in and even Cyborg is getting in on the action, but we still think that the Justice League needs one more hero to round out the roster. We think that person is you. All you need is the right outfit (and maybe some superpowers). This officially licensed Aquaman costume turns you into the iconic superhero from the DC cinematic universe. 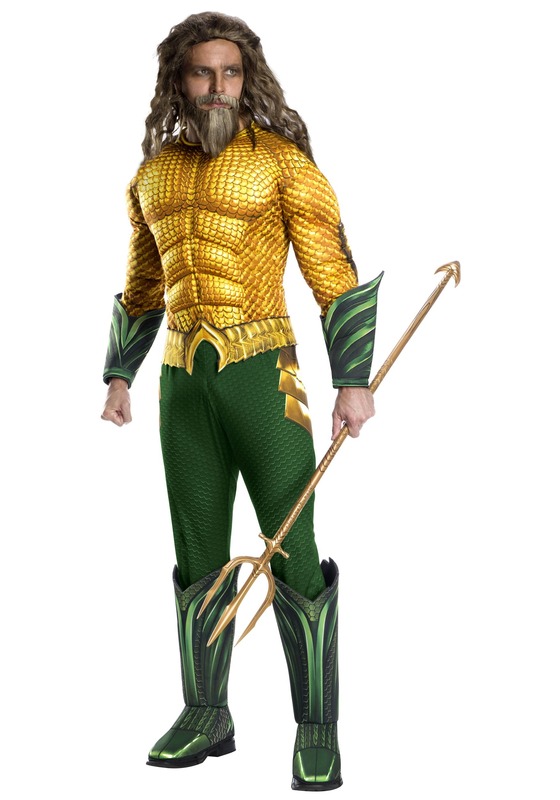 The costume comes with a full jumpsuit, which has muscle padding in the chest and arms to make you look as buff as Jason Momoa. It also comes with printed details on the exterior, necessary for anyone trying to assume the title of Atlantean King. The bottom portion of the jumpsuit has scaled printing designed to look like armor. It even has a pair of boot covers attached to each pant leg, allowing you to wear your favorite pair of shoes with this costume. Once you’ve assumed the role of Aquaman and sworn an oath to protect the Earth, then we can rest easy over here. Then, if Darkseid ever does show up on Earth, you can send him packing with your smoldering new look. Oh, but make sure you grab one of our trident accessories. You’re going to need it if you want everyone to think that you’re the king of the oceans!